Dr. Mills studied medicine at the University of Edinburgh, Scotland. He practiced medicine for a short time in Montrose, Scotland. Before he immigrated to Canada, Dr. Mills was a surgeon on a whaling ship for 3 years. After he immigrated to Canada, he settled in Tilbury East Twp (Kent County). He married Martha Campbell on the 27th of November, 1838 in Tilbury East Twp. She was born on the 12th of November, 1822 in Ballymoney County in Ireland, the daughter of Charles Campbell and the former Margaret Lamont. Her siblings were; Andrew, John, Mary, James, grace, Charles, William and Isaac. Her family immigrated to Canada between 1832 and 1838. 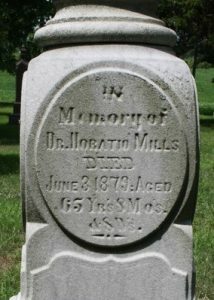 Dr. and Mrs. Mills had 7 children; Joseph (born about 1842), Margaret Jane (born 02 June, 1844), Emma Louisa (born in December 1847), James W. (born about 1849), Robert Henry (born about 1852), Horatio Edward (born February 16th, 1854) and Hugh Isaac (born 22nd of December, 1861). With his sons, Dr. Mills cleared 100 acres on Lot 11, Concession 4, in Romney Twp which the Mills family farmed. 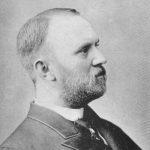 He opened a post office in his home in 1864. With the consent of Canada Post, it was named Old Montrose. The post office closed 16 years later in 1880. 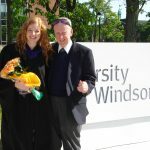 For many years after he came to Canada, Dr. Mills also taught school in Kent and Essex County. 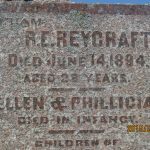 In 1850 he was practicing medicine in Wheatley, Ontario and continued to do so until his death on the 3rd of June, 1879 in Wheatley, Ontario. 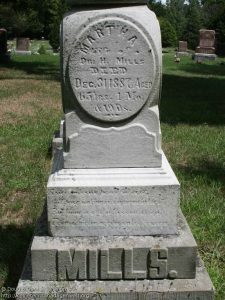 Mrs. Mills died on the 31st of December, 1887. They are buried at Erie Cemetery, near Wheatley.